If you are working with OpenInsight (as an end user or a developer) or one of the other leading MultiValue database technologies, you’ll want to know what is happening with OI 10. The changes are going to be far reaching, they are going to revolutionise your interface and there will be something for end user, developers and anyone needing to get a little more from their Multivalue based system. The first date for your diary is Tuesday 23rd September 2014. RevUK will be hosting their next Revelation User Group (RUG) meeting at the Hilton Doubletree in Ealing, London. The agenda will be largely about catching up on what has been going on at Revelation since we last met and mainly the forthcoming OpenInsight 10 release. As always, this will be your ideal opportunity to meet and exchange ideas with other OpenInsight developers and users and to put your questions and needs from the product direct to Mike Ruane (President and CEO of Revelation Software) who will be over from New Jersey, USA and also to the RevUK team. Please email Martyn for further details and to register your place on this key Revelation EMEA event. Whilst the RevUK RUG will be an update on the project thus far, the main event will be the main Revelation Software Users Conference. This will be held on 24th to the 27th March 2015 and it will be hosted in Houston, Texas, USA. The actual venue will be announced a little later, but please contact Martyn if you are in the EMEA region and you wish to register your interest in attending, or info@revelation.com if you are in any other region. The world conference will the optimal event to learn all about the new version of OpenInsight. With Houston being OpenInsight 10’s official debut, there are bound to be highly informative break out sessions for developers and end users that should enable you to claim this invaluable event against your training budget. 23rd September 2014 – RevUK RUG Meeting, Ealing, London, UK. 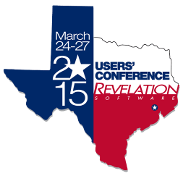 27th March 2015 – RevUS World Conference, Houston, Texas, USA.